Petite Republic Giveaway – Hot Pink Romance! Its time for my giveaway again! I am going to make this end on Friday, so that I can mail out this dress at the same time as the last give away! This will be the last give away for probably 6-8 weeks, but I got more coming after I am done with the wedding! This time, I am giving away my HOT PINK ROMANCE dress! I love the cut of this dress, but I need a little more boobies for this. Also, the pink is a little too daring (the picture makes it look darker than it really is). You will also need a little sewing skills to finish the hemming the way you want (i would suggest bubble skirt! So any petite, daring, and blessed (up there) seamstress want this? Just leave a comment! As long as you promise to attempt to wear it, I will give it! Any daring girls out there who will make a statement with this dress? This entry was posted on Tuesday, April 13th, 2010 at 12:43 am	and tagged with dress, giveaway, hot pink and posted in giveaways. You can follow any responses to this entry through the RSS 2.0 feed. Hm… is it not possible to do a little hemming on the sides for the chest problem? Looks like I’ll be fine for it though. As for the colour… that’s what is worrisome. bubble skirt would be cute. I’ve never tried that before… will have to peruse a tutorial. i love it! love the color! ME ME! PICK ME! I won’t promise to attempt to wear it; I WILL wear it! I should also get this dress because my final exams are coming up and I want to wear this to the exam hall to prove that cute girls with awesome fashion sense have brains too! Looks like a cute dress my bestie would and could wear! 🙂 Very cute! I would love to wear it myself, but she has the boobies to fill it out better 😉 Thanks! Your cast offs are so for me. Pick me! I won’t get to drink beer at a backyard grill out in your dot dress but I could sure spend a the day in a museum with girlfriends and a toy-art-shoe- gallery event (my boyfriend-total design nerd) on a sultry night in that! Aw, you won’t model your clothes anymore ? hahaha, Dexter thought this dress looks ridiculous, so I have a hard time working this dress in front of his camera! Oh I heart this dress! 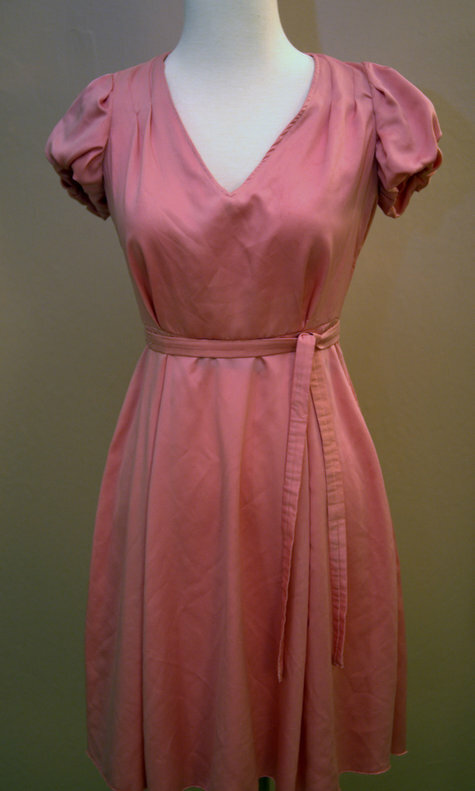 Pink is my favorite and look at those darling puffed sleeves (Anne of Green Gables would be giddy, for sure)! I could totally see me wearing this dress for a picnic in the park. I’m 4’11” (on a good day) and, unfortunately, blessed “up there” (which makes finding good fitting dresses so difficult). And modeling the dress would give me a great excuse to update my woefully stagnant blog. The dress is so pretty! I love the full skirt and wowuld hem to right below the knee. I hope I win it! oh, im an asian petite one too..
that dress nice..love puffy sleeves. O.M.G. this dress has my name on it, more so because of the size! Has it been given away to a lucky person?